Carle Van Loo, La halte de chasse, 1737 (*The hunting halt) (1). 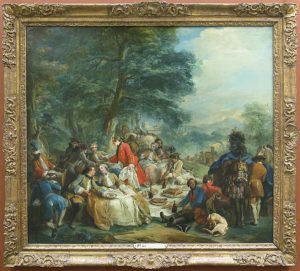 We are proposing a 19th century reproduction of La halte de chasse (1737) by Charles-André, called Carle, Van Loo (1705-1765), a famous painter of the 18th century at Louis XV’s court. This painting is a perfect representation of all the lightness that increases during Louis XV’s reign, both in painting and in way of life. Freeze frame. 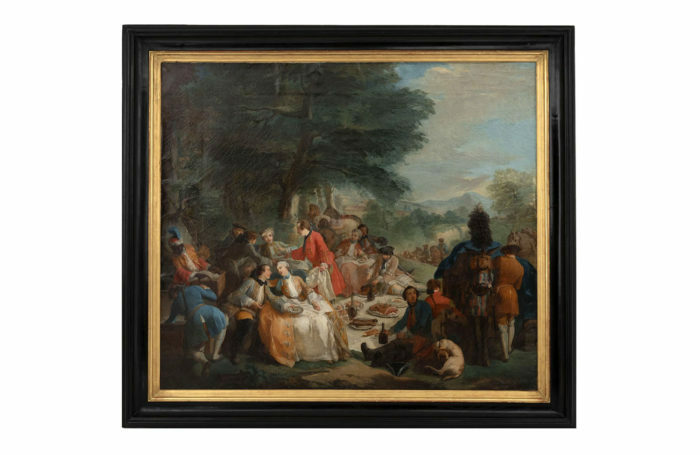 This canvas represents a lunch during a hunting halt in the forest, painted in the manner of 17th century Dutch landscapes. 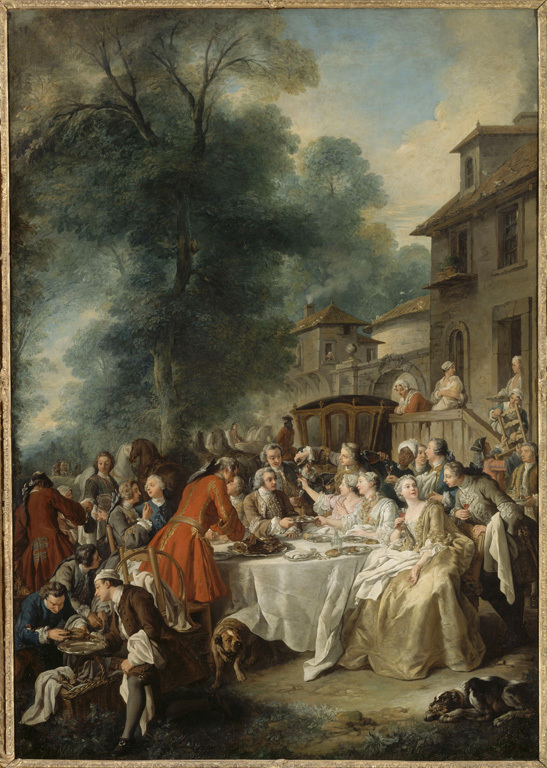 There are different characters: in the middle, slightly on the left, the main couple, richly dressed, has lunch while bantering; it has been said it might be a representation of the French king Louis XV with one of his mistress. Behind them, we can see many victuals on the wide white tablecloth. All around, men in more practical clothes being served by servants, one of them black and wearing a turban; a symbol of the highness and richness of all the invited people having lunch at this halt. Kings loved to hunt, and in particular Louis XV, who went hunting many times a week and sometimes several times a day. For this, hectares of land near Paris or the Great Versailles Park were at his disposal. Being invited by the King to go hunting was a privilege; except authorization, he was the only one allowed to shoot. Hunting with hounds (in French vènerie) was usually reserved to men, for it was considered too violent for women. Nevertheless they were invited to join men during the halt; it was the perfect occasion, in a pastoral atmosphere, far away from the rules of etiquette, to seduce each other; that’s why these are called “fête galante” paintings. Each sovereign has his style, and Louis XV has lightness: representing such moments of softness and carelessness is typical of fête galante paintings. The apparition of these manners results from the combination of different elements and, among them, the evolution of morals and the change of sponsors. Under Louis XIV, whose authoritarian reign was mainly devoted to the highness of the king and kept a certain apparent respect of the decency and of rules of etiquette, morals were more controlled, at least in public; the main source of art commissions was royal and essentially in the aim to glorify the King. Under the Regency and Louis XV, morals were lighter and high aristocracy begun to do debauchery notoriously. 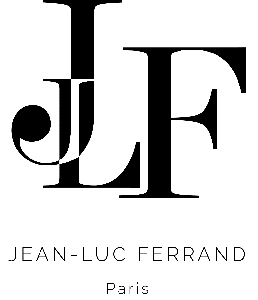 This softening of morals go along with a new way of thinking of most part of intellectuals and philosophers of this time: the individual is an entire human being with his own personal liberty and becomes the new trendy center of reflection; experiences and pleasures he can live are logically the new focal area. Sponsors changed a little bit: under Louis XV, private orders increase and exceed State and Church orders; artists follow the new tastes of these new customers, who prefer lighter subjects in painting, in line with their new activities. Nevertheless, State art commissions still exist and adapt themselves to the new taste; indeed this Carle Van Loo’s oil on canvas was commanded to decorate the dining room of Louis XV small apartments in the Fontainebleau Castle, where it was close to the Un déjeuner de chasse (2) de Jean-François DE TROY, and La Halte des grenadiers de la Maison du Roi by Charles PARROCEL. Wide historical and mythological paintings are substituted by scenes showing daily pleasures of life, such as meals, parties, baths, outdoor walks or loving intrigues scenes. 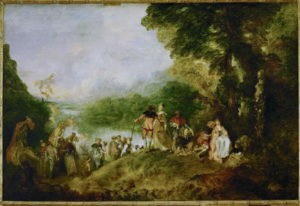 The work of art usually considered as the first example of Fête Galante paintings is the Pelerinage à l’île de Cythère, 1717, (3) by WATTEAU. 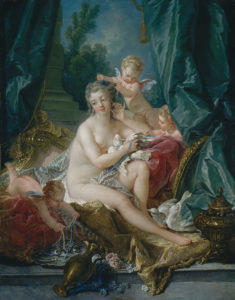 More paintings of different subjects can be added to this category, such as La toilette de Vénus, 1751 (4), by François BOUCHER and, later, the famous Les hasards heureux de l’escarpolette, 1767, by FRAGONARD. So, the Fête Galante paintings include all kinds of subjects concerning seduction, outdoor pleasures or more intimate interior scenes. This light genre, far from a certain moral decency, was deeply criticized, particularly by DIDEROT. Nevertheless, this apparent reject has no links with painters technical skills. Indeed, Carle Van Loo was recognized quite unanimously as a great painter (by GRIMM and DIDEROT), and he had such a bright career. Protected by Louis XV, he became the first painter of the King in 1762, such as Charles Le Brun under Louis XIV, and like him was also named Director of the Academy in 1763, function that gave him a certain power on the official taste. Way beyond painting, it’s all the interior decoration, for 30 years, that becomes soften: painted subjects are quite fun, colors are lighter with delicate and pastel shades, curved furniture doesn’t stop to be more curved and its the whole Louis XV’s reign that gains a new identity. This decorative runaway stops in the 1750’s because critics become too strong; LA FONT DE SAINT-YENNE (L’ombre du Grand Colbert, 1752) and COCHIN (“Supplique aux Orfèvres”, Mercure de France, 1754) pave the way to DIDEROT’s commentary to La lecture de la Bible by J.-B. GREUZE in his Salon de 1755 : even if he appreciates technical skills of painters such as BOUCHER, he really had enough of subjects that are debauchery to him and opulent compositions full of « culs joufflus and vermeils » . Some painters resist, like BOUCHER and FRAGONARD, but others bent, such as Carle Van Loo, who indulges some neoclassical inflections (see L’adoration des mages, circa 1739). The Fête Galante genre in painting and Louis XV style as a whole are weakened during the second part of the 18th century, in which it coexists with the first signs of neoclassicism. This combination creates a new style, the Transition style, and then the Louis XV style definitely leave room for Neoclassicism.